This section provides information on items of interest in the continuing development of Alsim, our team and associate service approach. 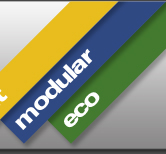 Alsim has launched new versions of their Unit, Modular and Eco product range literature documents. These new publications provide a comprehensive view of the Company's extensive collection of secure accommodation products and an introduction to the benefits that a service oriented organisation like Alsim can bring to you. The Company is pleased to announce the formal approval of their NICEIC accreditation. All electrical work is carried out by our directly employed team of electricians and this registration demonstrates our skill and professionalism in this area. Alsim’s new Eco range has been developed by the Company’s R & D department in response to a market demand for a product which successfully introduces environmentally friendly features within a market leading product proven to offer flexible secure accommodation solutions. The Eco range offers you the opportunity to benefit from the substantial environmental developments and whole life cost savings introduced within this innovative specification whilst still enjoying the market leading levels of product quality, flexibility and customer service for which Alsim is famous. Alsim’s Eco specification can be applied to all of our standard product types in both the unit and modular ranges in 1,2 and 3 storey arrangement. Alsim launches a revolutionary new modular system offering flexible secure accommodation solutions in 1, 2 and 3 storey arrangement in both standard and Eco specification. This high performance range is available in 24’ x 10’, 32’ x 10’ and 40’ x 10’ modular sections which can be configured in a variety of formats using both side by side and end to end linking to produce a complex of unlimited size and virtually any shape to meet a wide variety of accommodation requirements. The modular sections are provided in an attractive flat panel external finish which can be finished in an external colour scheme of your choice and successfully combine security with appearance to complete this market leading product range. Our existing range of product installation procedures has been updated and extended as part of Alsim's commitment to continuous product and process improvement. All existing customers will receive updates of the relevant documents which are also available from the procedure section of the website. Alsim has introduced a revolutionary effluent tank design to compliment our highly successful range of toilets. The unique design of the tank allows the unit to be stacked safely onto the corners of the effluent tank without the cost of jacklegs or the difficulties of burying the tank. The tank features interchangeable inlet positions and is supplied with a flexible jointing pipe to allow simple connection to the toilet waste outlet and thus providing a complete package from a single source. All of Alsim's effluent tank products have been designed, tested and developed by our R & D department as part of our program of continuous product and process improvement and are manufactured by the Company's specialist Component Division. We are pleased to announce the completion of the first stage of the major upgrade of our Surface Treatment Division. This important investment provides the Company with additional state of the art paint spraying facilities for our extensive range of secure steel accommodation units and complimentary staircases, effluent tanks and general components. We are pleased to announce the addition of 12' wide units to all product types within our unit range. We are one of the few manufacturers to provide this option and as you would expect from Alsim the product is fully supported by comprehensive structural calculations. The increased width of this new product creates a dramatically different internal atmosphere and a much enhanced working environment. Why not download the introductory PDF below for further images of this exciting development. The product is available now and standard drawings, layout, content, weight and dimensional information are available in the relevant sections of the site. This new extension of our existing product range was designed, tested and developed by our R & D department as part of our program of continuous product and process improvement. We have extended our staircase range with the introduction of new steps and new steps and landing assemblies. These useful items are designed to compliment our extensive range of toilet units and effluent tanks as they provide a safe entry and exit method to the raised unit. All of Alsim's staircase products have been designed, tested and developed by our R & D department as part of our program of continuous product and process improvement and are manufactured by the Company's specialist Component Division. Phase 1 of the extension of our Component Division is now complete. This exciting development means that Alsim is now well positioned to further develop our supply of ancillary items in support of our range of secure steel accommodation units. This self-sufficient department produces a wide range of staircases, landings, steps and effluent tanks as well as the specialist high security window shutters, personnel and store doors fitted as standard to our accommodation units. All products manufactured in the Component Division have been designed, tested and developed by our R & D department as part of our program of continuous product and process improvement. The future manufacture of our range of staircases and landings will be undertaken by Alsim's Component Division. This important move follows a similar decision on the specialist high security window shutters, personnel and store doors fitted as standard to our accommodation units. All of the staircase products will be designed, tested and developed entirely by our R & D department. The move will allow new designs to be conceived and brought to the market more quickly and also ensure the continued achievement of our quality standards. Alsim introduces an innovative New Personnel door. This innovative new door has been conceived and designed with security, flexibility and practicality in mind and as the exciting introduction of a single replacement for our acclaimed two previous designs for fixed and lift-off door systems. Alsim introduces a revolutionary new window shutter. This exciting new design successfully combines an innovative and highly secure locking mechanism with an attractive flush external appearance. Latest version of their industry leading website launched by Alsim. The site has been entirely re-developed both technically and visually as Alsim builds upon their reputation as a leader in the secure accommodation market. The new style has been adopted to enable the presentation of an ever increasing amount of information in an easily accessible and usable manner to ensure that all users can gain the maximum benefit each time they visit the site. New literature published as Alsim starts year with a record breaking order book. We are pleased to announce the availability of our new literature which has been launched in association with our new website. Quality to the forefront as Alsim expands QA team. The recent extension of our manufacturing capacity has of course been accompanied by the expansion of our Quality Control team in order to support our commitment to product excellence and the minimisation of faults and operational issues in all areas. Health & Safety brought in-house as Alsim appoints a dedicated internal manager. We are pleased to announce the appointment of a highly experienced professional to take responsibility for Health, Safety and Environmental matters within the Company. This appointee joins the senior management team and will play a key role in meeting our objectives in these important areas. New version of industry leading website announced by Alsim. The site has been completely re-developed using the latest Microsoft.net technology in order to allow us to build upon our previous success in meeting the changing and ever more extensive requirements of our customer base. The new site benefits from: improved site navigation with the introduction of context sensitive menus; standard colour reference charts; advanced viewing tools allowing zooming in and out and movement around the layout drawings; and dedicated standard unit weight pages to reflect the extended level of weight information provided with each layout drawing and unit. These new elements add to the wide range of functionality already available including: standard layout, elevation and foundation drawings; product features and specification; as well as operational procedures and guidelines. Alsim launches new literature in support of extensive marketing campaign. Sales team expanded as part of Alsim’s continued drive to improve customer service levels and simplify the sales experience. We have developed our sales function with the expansion of the key accounts department and the introduction of a dedicated sales administration team. The growth of the key account team will assist us in our goal to build upon our existing customer relationships by extending our presence throughout the country. The new sales administration team is in place to act as the first and central point of contact in respect of your day to day relationship with Alsim from the submission of an enquiry and the placement of an order through to the agreement of delivery arrangements and when necessary the resolution of product queries or faults. Alsim expands their Research & Development team with the appointment of a dedicated R & D Manager. We are committed to the continued development and improvement of our product range and our new R & D Manager will not only be involved in the assessment and introduction of new product features but will also play an active role in the investigation of any product faults.